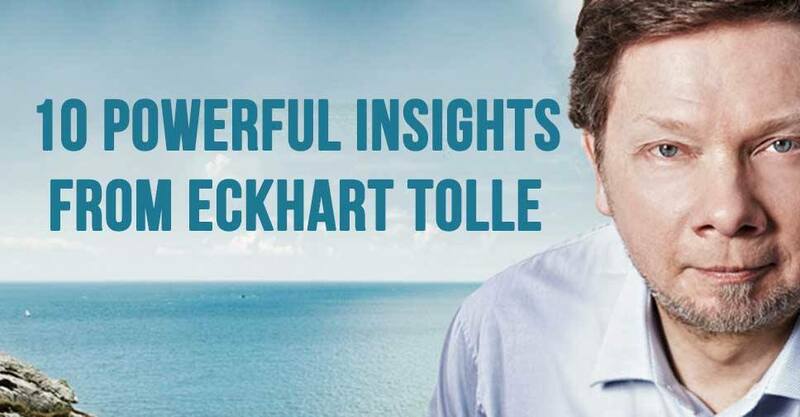 Reading Eckhart Tolle’s book “A New Earth” was simply a life changing moment for me and since then I have followed and resonated with his teachings. Seeking happiness is futile. If you seek happiness you will never find it. Happiness is created in the present moment by finding the joy in everything you do. Situations don’t bring unhappiness, your thoughts about the situation do. Be aware of your thinking and aim to bring facts so situations rather than emotional “stories”. One example Tolle gives is this- “I am ruined”- this is an emotional story whereas, “I have 50 cents left in my bank account” is fact. Sticking to the facts will help bring you clarity to move forward. The main voice in our head is the voice of the ego. You are not this voice, you are simply observing what this voice says. By observing this voice, instead of reacting with it, you create awareness and through this awareness you can free yourself from the limiting talk of the ego. The present moment is the only moment that is real. The past is already gone and the future is not yet here, so the only way you can live with truth is to live in the present. Living in the present moment and focusing your attention to the here and the now is the first step to achieving higher consciousness. Who are you? You are not your physical body but rather you are the essence that runs through it. While your body is your temple, identifying yourself with the physical can lead to suffering. Appreciate your body, but understand that you are so much more than it. Being a good person has nothing to do with “trying” to be good, being a good person starts with finding the goodness that is already present inside of you and then allowing it to emerge. If peace is what you really want, then you will always choose peace. If you would rather sit and suffer in the validation of the ego, you will go after the drama. Instead of trying to change your life in order to achieve peace, consider realizing instead who you are on the deepest level. The main cause of stress and anxiety is wanting things to be different than they currently are. When you bring acceptance to all situations, despite your expectations, you instantly remove the need for stress and worry. Looking outside yourself for fulfilment is the work of the ego. Instead, bring your awareness to the treasures that you have within and know that to love another, is to recognize yourself in the other. Whatever events life brings, know that they are here with the ultimate purpose of helping you to raise and expand your consciousness.